Primal Body, Primal Mind is a book written by Nora Gedgaudas, certified nutritional therapist and clinical neurofeedback specialist. Gedgaudas attempts to integrate our understanding of basic hunter-gatherer or Paleo diets with up-to-date nutritional and medical research. She reveals how modern diets differ from the way of eating for which our genes are programmed and outlines food and lifestyle recommendations to help everyone achieve total wellness and enhanced longevity. Primal Body, Primal Mind explains our primal origins and how modern diets are vastly different than the foods traditionally eaten by hunter-gatherers, to which we are genetically adapted. The author asserts that this is the primary cause for the modern epidemics of many chronic diseases including diabetes, heart disease and cancer. As such, Nora Gedgaudas has come to the conclusion that we need to limit our intake of foods such as grains, milk, soy, potatoes, sugar and vegetable oils. Instead we should emphasize organic meats, wild-caught fish, green vegetables, nuts, seeds and fats such as coconut oil and butter. Fruits should be limited because of their high sugar content, with the exception of some antioxidant-rich berries. Contrary to the usual advice, Gedgaudas asserts that saturated fats and cholesterol are not actually the cause of cardiovascular conditions and that these fats can conversely play an important role in our diet. She claims that a moderate intake of these fats only become problematic in the presence of dietary carbohydrates. She also goes into detail about the importance of an adequate intake of essential omega-3 fats, especially for maintaining the health of our brain and nervous system. Most of us do not consume an adequate amount of these fats in our diet so recommendations are provided for foods that are good sources of them. A wide variety of different topics is addressed in this book including the importance of vitamin D for prevention of cancer and other diseases, how diet influences hormonal balance and aging, adrenal exhaustion, ADHD, food allergies, practical strategies for dealing with sugar cravings and how to promote fat loss. Also included are meal suggestions, information regarding the protein content in foods, advice on nutritional supplements and a list of resources for further study. Eggs, salmon, tuna, sardines, shrimp, beef, pork, lamb, chicken, duck, turkey, cheese, macadamias, almonds, walnuts, pumpkin seeds, avocado, olives, coconut, berries, mushrooms, onion, broccoli, asparagus, cauliflower, lettuce, spinach, cabbage, Brussels sprouts, kelp noodles, kale chips, olive oil, butter, ghee, tea, decaf coffee. While exercise can have many important health benefits, only dietary changes can substantially change your biochemistry. So exercise should be regarded as an adjunct to a healthy diet and not a substitute. Generally dieters are advised in Primal Body, Primal Mind to avoid long cardio sessions in favor of short, intense workouts of no more than twenty minutes duration, because this type of activity is more in line with that of our primal ancestors. Weight bearing exercise is recommended to improve bone density and yoga can help to enhance strength and flexibility. 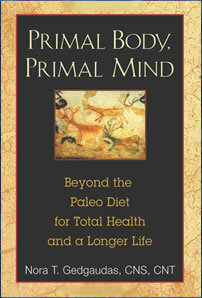 Primal Body, Primal Mind: Beyond the Paleo Diet for Total Health and a Longer Life retails at $19.95. Click here to purchase this book for a discounted price online. Encourages consumption of a variety of unprocessed organic foods. Relatively high protein intake can help to reduce appetite and maintain lean muscle. Can assist dieters struggling with problems related to blood sugar and insulin balance. Emphasizes the importance of omega-3 fatty acids. Suitable for those with allergies or sensitivities to gluten. Does not require a large time commitment for exercise. Requires elimination of many foods commonly regarded as healthy including whole grains, legumes and fruits. Some dieters experience fatigue on low-carbohydrate diets. Sample menus are not clearly outlined. Primal Body, Primal Mind offers a strategy for balancing our biochemistry and creating holistic health that is based on hunter-gatherer diets in combination with modern scientific research. This book will appeal to anyone interested in Paleo diets as well as dieters who enjoy learning about the science of nutrition and health.